A typical efficient car in the U.S. market gets about 40 MPG (miles per gallon) running on gasoline. A hybrid car like the Prius typically gets 50–55 MPG. In a previous post, we looked at the physics that determines these numbers. As we see more and more plug-in hybrid or pure electric cars on the market, how do we characterize their mileage performance in comparison to gasoline cars? Do they get 100 MPG? Can they get to 200? What does it even mean to speak of MPG, when the “G” stands for gallons and a purely electric car does not ingest gallons? 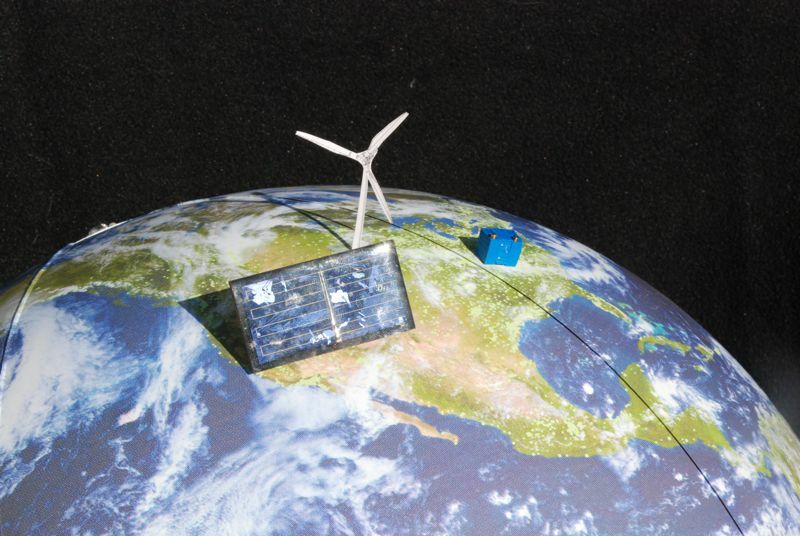 As we look to transition away from fossil fuels, solar and wind are attractive options. Key factors making them compelling are: the inexhaustibility of the source with use (i.e., renewable); their low carbon footprint; and the independence that small-scale distribution can foster (I’ll never put a nuclear plant on my roof, even if it would make me the coolest physicist ever!). With full-scale solar in the desert southwest, and wind in the plains states, we're going to need a big battery (items not to scale!). But solar and wind suffer a serious problem in that they are not always available. There are windless days, there are sunless nights, and worst of all, there are windless nights. Obviously, this calls for energy storage, allowing us to collect the energy when we can, and use it when we want. Small-scale off-grid solar and wind installations have been doing this for a long time, typically using lead-acid batteries as the storage medium. I myself have four golf-cart batteries in my garage storing the energy from eight 130 W solar panels, and use these to power the majority of my electricity consumption at home. It’s worth pausing to appreciate this fact. Compare this scheme to the dream source of fusion. Why do people go ga-ga over fusion? Because there is enough deuterium in water (sea water is fine) to provide a seemingly inexhaustible source of energy, and there are no atmospheric emissions in the process. Meanwhile, solar provides a source that will last longer (billions of years), produces even less pollution (no radioactive contamination of containment vessel), and is here today! It’s even affordable enough and low-tech enough to be on my roof and in my garage! People—we have arrived! As we saw in the previous post, the U.S. has expanded its use of energy at a typical rate of 2.9% per year since 1650. We learned that continuation of this energy growth rate in any form of technology leads to a thermal reckoning in just a few hundred years (not the tepid global warming, but boiling skin!). What does this say about the long-term prospects for economic growth, if anything? 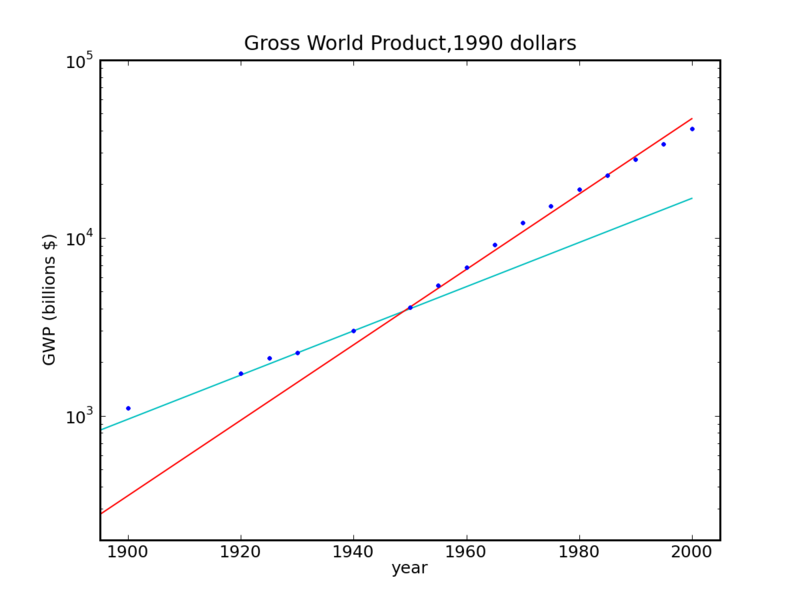 World economic growth for the previous century, expressed in constant 1990 dollars. For the first half of the century, the economy tracked the 2.9% energy growth rate very well, but has since increased to a 5% growth rate, outstripping the energy growth rate. The figure at left shows the rate of global economic growth over the last century, as reconstructed by J. Bradford DeLong. Initially, the economy grew at a rate consistent with that of energy growth. Since 1950, the economy has outpaced energy, growing at a 5% annual rate. This might be taken as great news: we do not necessarily require physical growth to maintain growth in the economy. But we need to understand the sources of the additional growth before we can be confident that this condition will survive the long haul. After all, fifty years does not imply everlasting permanence. 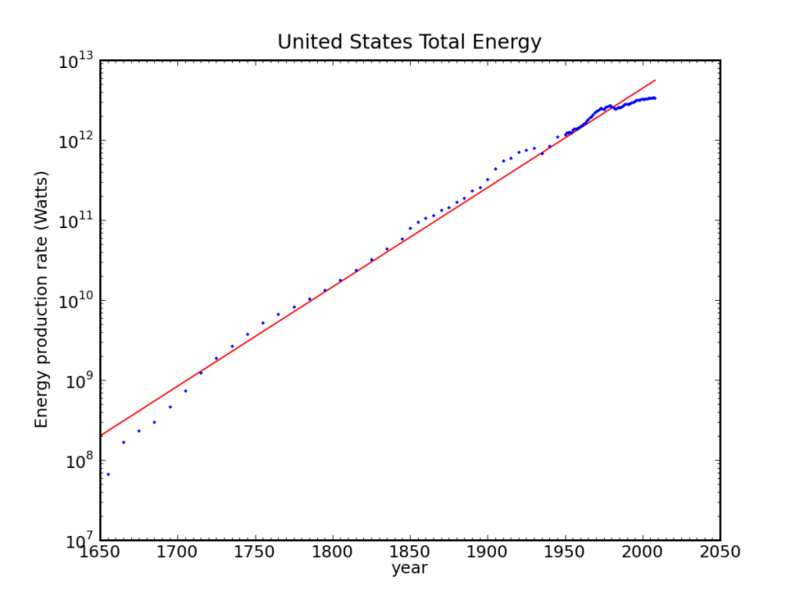 Total U.S. Energy consumption in all forms since 1650. The vertical scale is logarithmic, so that an exponential curve resulting from a constant growth rate appears as a straight line. 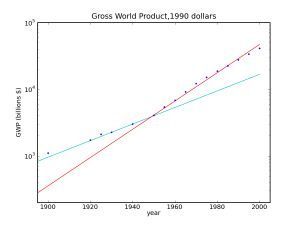 The red line corresponds to an annual growth rate of 2.9%. Data source: EIA. Growth has become such a mainstay of our existence that we take its continuation as a given. Growth brings many positive benefits, such as cars, television, air travel, and iGadgets. Quality of life improves, health care improves, and, aside from a proliferation of passwords to remember, life tends to become more convenient over time. Growth also brings with it a promise of the future, giving reason to invest in future development in anticipation of a return on the investment. Growth is then the basis for interest rates, loans, and the finance industry. Because growth has been with us for “countless” generations—meaning that everyone we ever met or our grandparents ever met has experienced it—growth is central to our narrative of who we are and what we do. We therefore have a difficult time imagining a different trajectory. This post provides a striking example of the impossibility of continued growth at current rates—even within familiar timescales. For a matter of convenience, we lower the energy growth rate from 2.9% to 2.3% per year so that we see a factor of ten increase every 100 years. We start the clock today, with a global rate of energy use of 12 terawatts (meaning that the average world citizen has a 2,000 W share of the total pie). We will begin with semi-practical assessments, and then in stages let our imaginations run wild—even then finding that we hit limits sooner than we might think. I will admit from the start that the assumptions underlying this analysis are deeply flawed. But that becomes the whole point, in the end. I have always been impressed by the fact that as much solar energy reaches Earth in one hour as we consume in a year. What hope such a statement brings! But let’s not get carried away—yet.